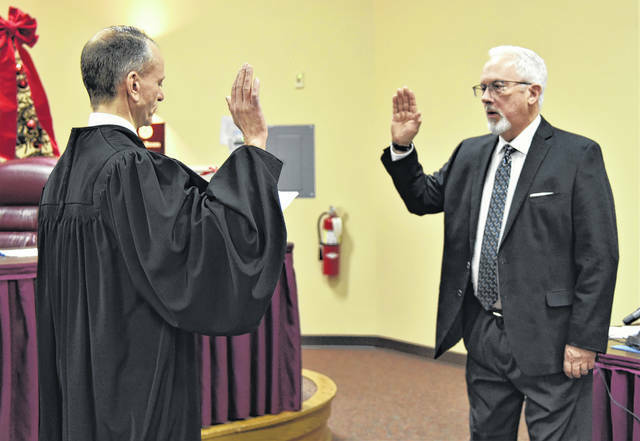 Delaware County Court of Common Pleas Judge David Gormley, left, administers the oath of office to Jon Bennehoof on Tuesday at the Powell Municipal Building. Council member Bennehoof was sworn in as the city’s new mayor. A familiar face is now mayor of the City of Powell. During its first meeting of 2018 on Tuesday, Powell City Council selected outgoing Vice Mayor Jon Bennehoof as the new face of the city. Bennehoof said while growing up in a steel mill family in Youngstown, he learned a “sense of service and responsibility,” but he never envisioned at an early age he would become a public servant. Times change, however, and after serving in the U.S. Navy and completing three consecutive tours in Vietnam, the idea of becoming a public servant grew on him, as did the thought of one day becoming mayor. “As I experienced life, I began to realize how important local government is in our daily lives,” he said. Nominated for the position of Powell mayor by council member Frank Bertone, Bennehoof — a council member since 2012 — said he has high hopes and expectations for the city as he replaces outgoing Mayor Brian Lorenz. A resident of Powell since 2003, Bennehoff is active in various committees tied to the city, including ONE Community, an intergovernmental committee he founded and currently serves as co-chairperson of that seeks to strengthen the working relationship between the city and its closest neighbor — Liberty Township. Bennehoff said two challenges facing the city that have his utmost attention are growth and sustainability. When he’s not involved in city-related matters, Bennehoof works as an IT consultant. Prior to his current career, Bennehoof retired from IBM where he worked most recently in the office of the company’s chief information officer. There, he was responsible for a global technology portfolio and for presenting to company executives and those attending seminars/conferences the CIO’s message as it related to IBM history, technological achievements, and programs. Longtime council member Tom Counts was selected by his fellow elected officials to replace Bennehoff as the city’s vice mayor.